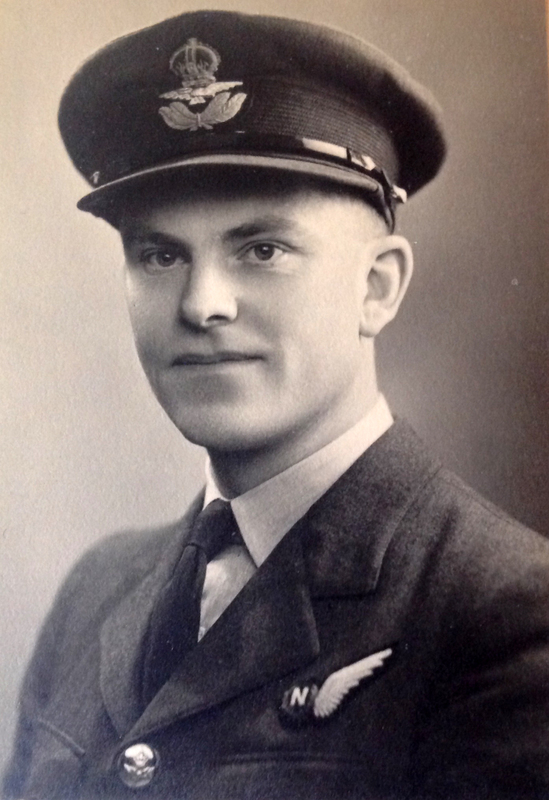 Many thanks to Mary for contacting me regarding her Father, Maurice Thorogood, who was a Navigator with 75(NZ) Squadron RAF between January and July 1945. Maurice arrived, I believe with Wallace Martin’s crew on the 16th January and flew 3 Ops with the crew between the 28th January and the 1st of February. For a reason, which is not clear, it would appear that Wallace Martin left the Squadron early in February, having flown only 3 Ops with his crew. 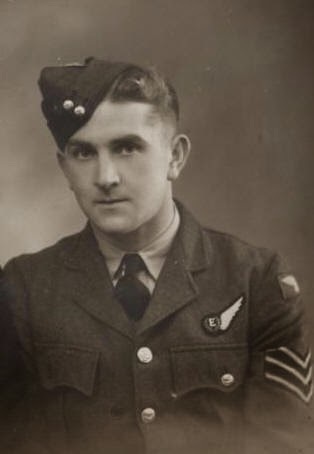 On the 2nd of February Lawrence McKenna arrived on posting from No.3 L.F.S – having already completed a tour with 101 Squadron and being awarded a D.F.C. Whatever the specific details of Wallace Martin’s departure from the Squadron, it would appear that Lawrence McKenna essentially took over the ‘headless’ crew and it was this ‘new’ crew with F/L Mckenna as Skipper that completed their tour with the Squadron. In addition to flying with the McKenna crew, Maurice also flew 2 ops with Wing Commander Mac Baigent. His role seems to have been a lead navigator, providing a new crew with Op experience with Mac Baigent acting as Pilot. Very interestingly, there also seem evidence of more errors in the Operational Record Book. 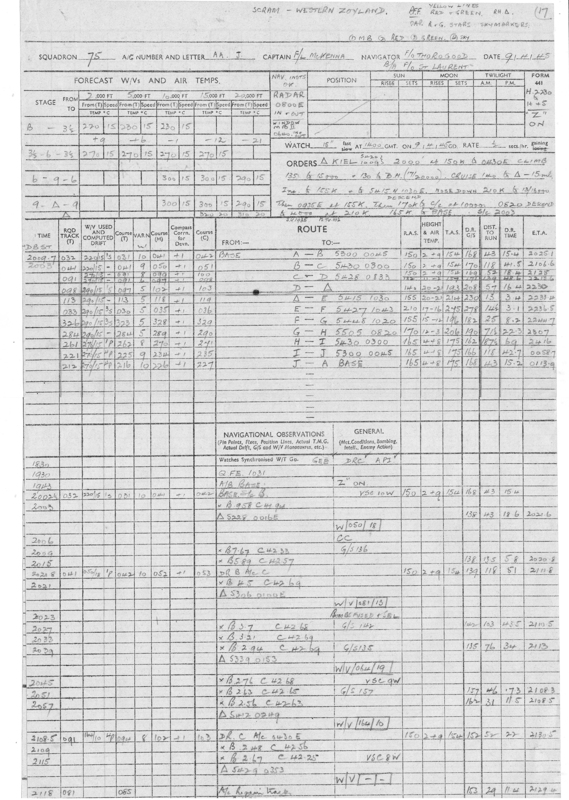 On the 16th of May, 26th of May and 22nd June Maurice’s Logbook clearly shows details of 3 Ops that are not, in the first case correctly recorded in the ORB and in the second 2 cases, not recorded at all. These Ops are placed in the Op history, though of course in the absence of a crew list for the second 2 flights, we must assume, based on the relative consistency of the McKenna crew, that the ‘normal’ crew remained unchanged. 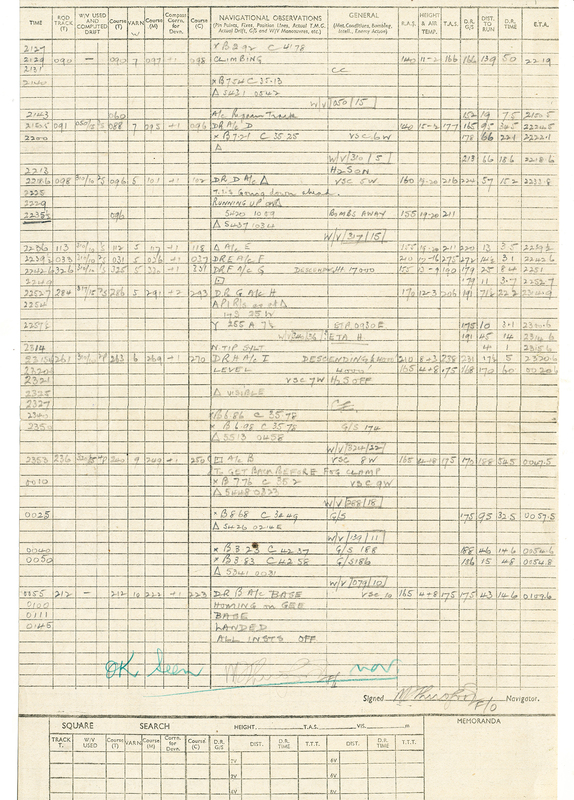 Mary has taken the trouble to scan over a series of parts a remarkably detailed Op chart for the 9th of April Op to Kiel and also included for this Op, what I will describe (in ignorance of its proper title) as the Navigation route list for this Op. Both of these documents, thanks to Mary scanning them in parts, means that they are astonishingly detailed and should certainly be clicked on to zoom in and see that detail. W.R. Martin and crew arrive on Posting from No. 31 Base. Twenty aircraft attacked Cologne (Gremberg) as ordered, carrying 4,000 H.C., 500 ANM., 500 M.C. “50 G.P. and Munro bombs. Cloud broke to nil just before the target and crews were able to identify the marshalling yard. Accurate slight to moderate H/F was met over the target. No fighters were seen. Bursts were seen on the marshalling yard. All returned to base. Nineteen aircraft attacked Krefeld marshalling yard in ten tenths cloud, carrying 4,000 H.C., 500 ANM., 500 M.C., and 250 G.P. Bombs. 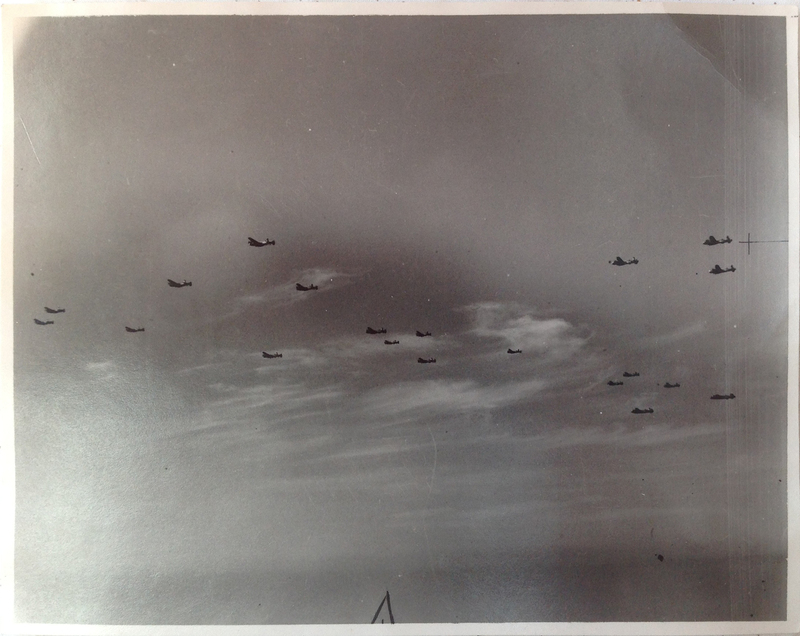 Aircraft bombed in formation with the aid of instruments. A good concentration was reported. Slight H/F over the target was the only opposition encountered. Seventeen aircraft bomber Munchen Gladbach. No results were observed owing to cloud being ten tenths over the target. Twenty one aircraft attacked Wesel as detailed. Slight accurate H/F was encountered over the target but no fighters were seen. A concentrated raid was reported. Twenty aircraft attacked Wesel. Twenty one were detailed but AA”R” F/S Scott, returned early through technical trouble. Aircraft bombed on special equipment in ten tenths cloud with tops about 10,000 ft. Leaders were satisfied it was a good raid. Very slight H/F was only opposition. Twenty one aircraft were again detailed to attack Wesel. AA”J”, captained by F/S Lukins, B.L., returned early through engine trouble. Cloud was 1-10/10ths with some haze. A few crews were able to identify the river bend. Bombing appeared to be accurate. Very slight H/F was the only opposition. Sixteen aircraft attacked Gelsenkirchen as detailed. There was ten tenths thin cloud over the target with horizontal visibility between 500/ 1000 yds. Formation keeping was very difficult in these conditions, but crews reported quite a good bombing concentration on special equipment and leaders. Opposition from flak was very slight and no fighters were seen. F/S Barr, D. landed at Warboys. Two aircraft laid mines in the Oslo Fiord area. Both crews reported a good trip without opposition. Cloud 8 – 10/10ths. Thirteen aircraft attacked Dessau as ordered. Aircraft bombed in 10/10ths haze and thin cloud. Crews were given instructions by M/B to bomb on skybmarkers but some were able to make out T.I’s and in two cases identify the street. Fires were burning over a wide area when aircraft left the target. Flak practically nil in target area. Some E/A were seen and AA”S” F/L Spilman had a short inconclusive encounter. A satisfactory operation. Seventeen aircraft were detailed to attack the coking areas and Bensol plant at Bruchstrasse. Cloud was 10/10ths over the target with tops at 6/7,000 ft. Crew report formation was good through the target and bombs fell away together. No results were seen. Slight H.F was encountered. Twenty one aircraft attacked Hamm (Sachsen) as detailed in ton tenths cloud, tops about 8,000 ft. Formation was well packed in the run in. No results were seen other than smoke pushing up through clouds after bombing. Very slight flak was the only opposition encountered. Nineteen aircraft were detailed to attack Kiel, carrying 8,000 H.C., 4,000 H.C.N. AND 500 A.N.M. A good concentration of bombing was carried out which appeared to have been a good prang. Many fires and explosions were seen. There was no fighter opposition. Flak was moderate. 21 aircraft were detailed to attack Kiel. The target was covered by 10/10 cloud with tops 4/5000. 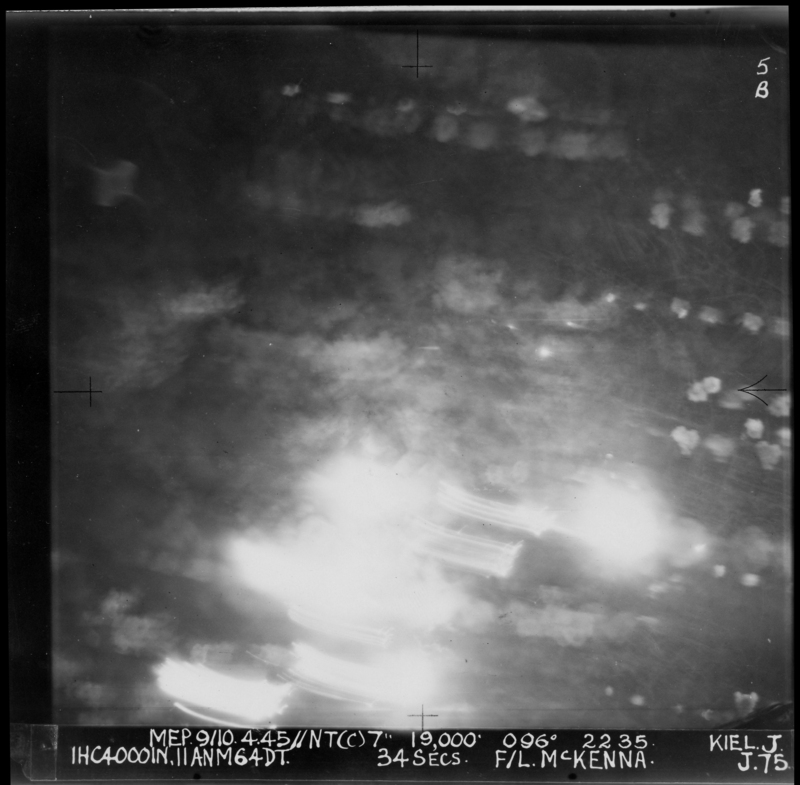 Bombing was concentrated and fires were seen on leaving the target. Flak was slight. M/B was clearly heard. (AA’K’ F/O. Morgan W.) returned early, bombs were jettisoned. This was also a leaflet raid. 25 aircraft were detailed to attack the target HELIGOLAND. Weather was good with good visibility. Crews were able to identify northern top of Island and also western edge. The rest of the Island was obliterated by smoke. Bomb bursts on fires. The crews bombed as ordered by the Master Bomber and bombing was thought to be well concentrated, but there was some overshooting as well as undershooting. 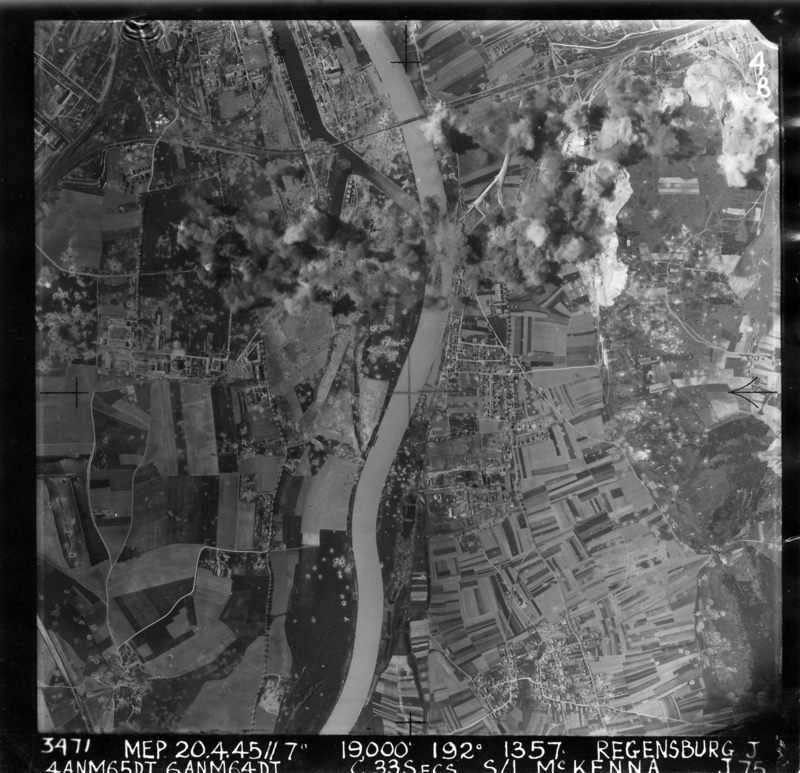 20 aircraft were detailed to bomb REGENSBURG. Perfect visibility and the river, dock and target areas could be made out. Bombing appears to have been fairly well concentrated round the target starting with a slight undershoot but some bombs also spread to the M/yards beyond. The crew on starboard side of formation claimed direct hits on railway bridge. Flak slight but accurate. 21 aircraft were detailed to attack BREMEN. 2-5/10ths cloud over target and many crews made out river bend and factory area. Bombing results were satisfactory though slight overshooting and undershooting but not outside built up area. Flak from Wilhemshaven and Bremen was at intervals moderate and very accurate. 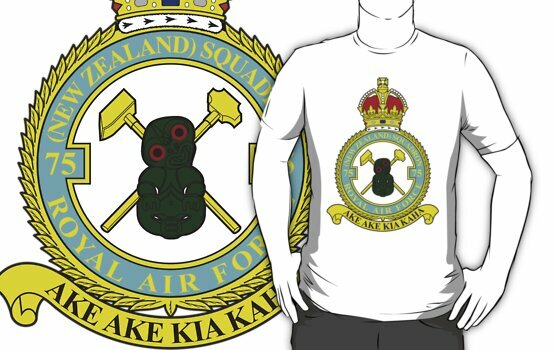 Flight Engineer (Sgt. R. Clark) of AA/P was killed. No fighters seen. Again, it seems as if Mac Baigent takes up a crew, minus the Pilot, but with Maurice on an initial Op. In this case it was Edward Plowman’s crew – ironically, or bizarrely, Ed Plowman also flew on this Op, but as 2nd Pilot with Charlie Stevens and his crew. 21 Aircraft were detailed for Supply Dropping at Delft. This mission was successful. The crowd were not as large as usual, but more flags were observed. F/O E.Ohlson reported having seen Germans in barracks cheering and waving white flags. F/O R, Flamank saw Germans waving from gunposts on the coast. 10 Aircraft were detailed for repatriation of Prisoners of War. The number of men brought back was 240. S/Ldr. B. Mckenna (AA.J) crashed when taking off at Dunsfold for Base. There were no injuries and the crew returned with F/Lt. M. Adamson (AA.K). Complaints were made of the bad landing procedure at Dunsfold. 15 Aircraft were detailed for the evacuation of Prisoners of War from Juvincourt. The total number returned for the day was 336. F/O G. Cleminson (JN.O) developed a hydraulic leak at Juvincourt. He had to stay overnight and on the return trip next day, brought another 24 men. The total number of men brought back to date is 1320. 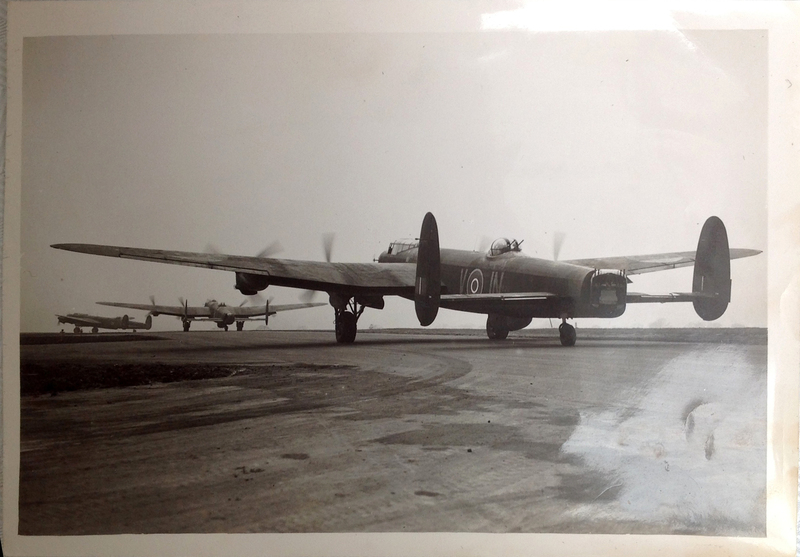 4 Aircraft were detailed for the evacuation of Prisoners of War from Juvincourt. 96 men were brought back bringing the total number now to 1967. 4 aircraft are listed for this Op, but it does not include the McKenna crew. 7 Aircraft were detailed for the repatriation of 71 Belgian refugees. 120 ex Prisoners of War were brought back on the return trips. Flight Lieutenant Lukins was involved in a slight mishap at Brussels and some of the crew were brought back by another aircraft. 5 Aircraft were detailed for viewing the effects of the Bombing Offensive. This Op is not listed in the Operational Record Book – we must assume this was the ‘normal’ McKenna crew. 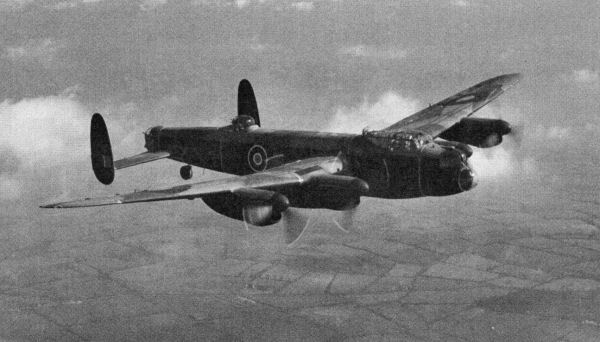 2 aircraft were detailed for viewing the effects of the Bombing Offensive. 11 aircraft were detailed for the Post Mortem Operation for checking German radar equipment. This entry was posted in general and tagged 1945, 75(NZ) Squadron RAF, Aviation, Bomber Command, Gordon Albert Mills, H. St. Laurent, Laurence Douglas McKenna, Leslie Thomas Patrick Murphy, Maurice Frank Thorogood, Mepal, Sidney George Frederick Sizeland, T. Harper, Wallace Bassett Martin, World War 2 on October 18, 2014 by 75nzsquadron.